In a business context, agility is the ability of an organization to rapidly adapt to market and environmental changes in productive and cost-effective ways. The adoption of business agility mindsets, structures, and practices is accelerating. Despite the hype, it’s more than a buzzword. It is a significant, yet nuanced, change in the ways companies operate. In today’s unpredictable economy, the benefits are clear. According to the 2018 Business Agility Institute (BAI) Report, one of the primary goals of business agility is to improve market success. Not just by working more efficiently, but by developing new ways of delivering customer value and bringing the right products to market faster. Survey respondents in the BAI Report indicated that they have seen market success through improved business development, recognition by their customers, and improved product or service delivery. It should come as no surprise that small organizations have more agility than large organizations. Business agility plateaus at around 50 employees, with the fluency of larger organizations dropping an average of between 16% and 27%. As organizations grow, they put in place extra processes and systems to handle the growing complexity. This is especially true of organizations above 150 people (Dunbar’s Number). Without clear design, it’s easy to fall back on traditional processes, which are designed to scale management rather than business agility processes, which are designed to descale complexity. Many respondents report that they are struggling with transforming entrenched culture and processes; most commonly developing new funding models and transforming HR, Finance, and other supporting functions. Several common themes emerged across all organizations: Leadership, Lack of Buy-In, and Inappropriate Organization Design are the top three. 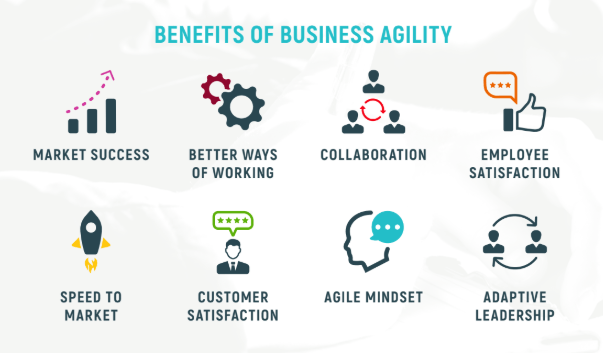 Despite these challenges, most survey respondents also report that they are experiencing tangible benefits from their investment in business agility; from better ways of working, increased employee and customer satisfaction, and improved market performance. increases in business agility fluency the more teams and functions are in scope for the transformation. When examining specific divisions, while there are fewer organizations transforming support functions (Finance and HR), those that do have higher outcomes. So, how do you start implementing business agility? Or, better yet, how do you sustain business agility across your enterprise? The proven Enterprise Business Agility Model shows you how to enable measurable and sustainable enterprise business agility transformations across all areas of business operations and delivery. This model helps your organization achieve true business agility – so you can adapt and change, learn and pivot, deliver at speed, and thrive in a competitive market.